The Theatre Department produces an annual season of plays, offering a variety of performance and technical opportunities for both students and community members. The season includes classic and contemporary works, musicals, and children’s plays. All academic productions are free to the public and seating is on a first-come, first-seated basis. No tickets and no reservations. When Mullah Nasir-uddin and his (mostly) faithful donkey, Fidhu, overhear a scuffle between soccer teammates, they know that something must be done. Mullah and Fidhu decide to visit the feuding teammates in their dreams that night. The dreamers must band together with Mullah and Fidhu, as the adventure leads them on a wild course filled with many curious creatures. With his witty wisdom, Mullah teaches the dreamers that understanding can triumph over all their fears. Based on Mullah Nasir-uddin stories from the Pakistani Muslim culture, where the wise fool is a mainstay in traditional folklore. 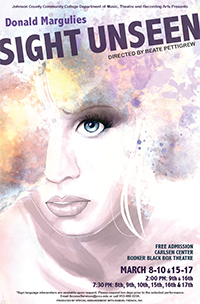 In addition to the above campus performances, this production is designed to tour on Fridays during the Spring 2019 semester. If you are interested in bringing Dreaming with Mullah Nasir-uddin to your school or other venue, please email tour manager Professor Tim Noble or call 913-469-8500, ext. 3982. This is the story of an American mega-artist so successful he's had the obligatory profile in Vanity Fair and can claim astronomical prices for his works sight unseen from a waiting list of wealthy patrons. In England for a retrospective of his paintings, the artist goes into the countryside to visit his original muse and lover, the "sacrificial shiksa" whom he abandoned in his quest for the opulent life which now devours him. Someone sneezes. Someone can’t get a signal. Someone won’t answer the door. Someone put an elephant on the stairs. Someone’s not ready to talk. Someone is her brother’s mother. Someone hates irrational numbers. Someone told the police. Someone got a message from the traffic light. Someone’s never felt like this before. In this fast moving kaleidoscope, more than a hundred characters try to make sense of what they know.